Two cities – a thousand lakes, a vibrant culture, and excellent coffee and tea - our second year touring the Twin Cities’ specialty caffeine scene was a fascinating delight, and offered a “rainy day in a coffee shop” ambiance with a drizzly afternoon thunderstorm. After a great kickoff and raffle benefitting Chloe’s Fight at Roaster Sponsor Peace Coffee, crawlers grabbed event bags and we were off! At Dogwood’s new MIA coffee bar, crawlers sipped Burundi brewed via Chemex on the Modbar, and sampled cold brew vs. iced coffee at Bull Run. Rustica Bakery provided a Clever brewing demo, coffee three ways and cookies, and we licked every last drop of our Salted Honey Caramel Affogatos from mason jars at Groundswell. Angry Catfish Bicycle and Coffee Bar was a welcome respite for the gallant bike group crawlers, who braved the stormy skies and were rewarded with warm cups of Siphon vs. French Press brewed Intelligentsia coffee. Teasource went all out with a wonderful variety of flavorful teas, including a Jin Jun Mei black tea, steeped multiple times to emphasize flavor differences of each steep. Peace Coffee’s Wonderland location served up a three course marvel of caffeination, with three espresso drinks involving lemons, blueberries, avocados, and a nod to Audrey Hepburn. When the caffeine jitters set in, crawlers dived into their event bags for sustenance – treats from Groundswell, Rip Van Wafel, and Earnest Eats were just the right snack. We watched a roasting demo and sipped cold brew at J&S Bean Factory, and tasted chai three ways from our sponsor Gray Duck – traditional iced, a spicy Arnold Palmer, and a fresh take on a chai cocktail. Crawlers flipped through their very own issues of Barista Magazine and HerLife as we wound down, and the other goodies from Yelp, Libations App, Wholesome Sweeteners, Gray Duck and TeaSource rounded out the souvenir department. 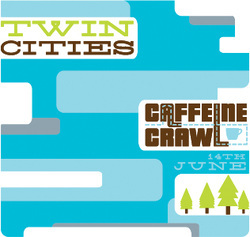 The Twin Cities dynamic beverage scene provided a vibrant, varied, and delicious experience, and it was, truly, a caffeinated pleasure!